SIMI VALLEY, Calif. - May 9, 2018 - PRLog -- While many indoor and outdoor ranges have developed and implemented lead best practice management and recovery programs, the fact remains that lead is a toxic substance that can cause harm to people and the environment. 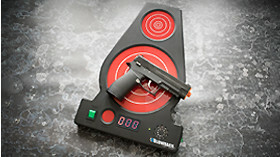 For every 60 shots taken with the Blowback Laser Trainer saves on a pound of lead effect to the environment. If you have a force of 1,000 officers shooting 250 rounds of ammo per year that equals 41,650 lbs. of lead injected into the environment. While shooting a real firearm cannot and should not be replaced, the shooting proficiencies of your law enforcement professionals can be increases ​by practicing with the Blowback Laser Trainer on a regular basis with the added benefit of remaining environmentally conscious at the same time.